Whiteflies have been reported over the last week from a farmer call to Carl Duley, Agriculture Agent, UW-Extension Buffalo County in western Wisconsin. I also found a few whiteflies during our soybean aphid sampling in research plots in Columbia County in southern Wisconsin. Additionally, some soybean fields in northern Illinois are infested with whitefly as reported by Mike Gray in the Bulletin, University of Illinois’ field crop newsletter, Whitefly Infestations Reported in Some Northern Illinois Soybean Fields. Adults and nymphs have piercing and sucking mouthparts to remove plant sap. They feed primarily on the underside of leaves and inject salivary enzymes that disrupt plant growth. Under heavy infestations plants may become discolored and begin to wilt. 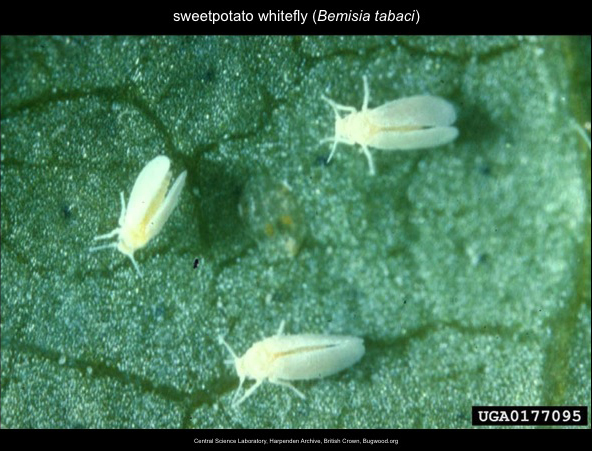 Similar to soybean aphids, whiteflies produce honeydew on the leaves and other plant parts where sooty mold can develop. 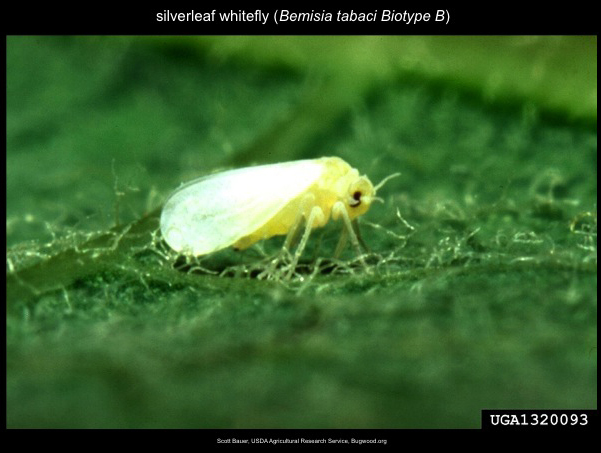 Whiteflies are most commonly seen on velvetleaf or button weed, and soybean fields with heavy weed populations may have higher whitefly numbers. There are no economic thresholds established for whiteflies in soybean. Various whitefly species are known to feed on soybean in the Midwest occasionally but have never been known to cause economic damage. Yield losses have been reported from whiteflies on soybean in Florida and Georgia. Whiteflies have a very wide host range. This insect group is known for developing resistance to insecticides in greenhouses and cotton fields. It is advisable to be aware of this insect and be able to tell the difference between soybean aphid, whitefly nymphs and adults, and twospotted spider mite. If whitefly populations increase in number and co-occur on soybean with twospotted spider mite or soybean aphid, then yield impact is more of a concern. For more information and images, please see our brochure publication Identification of Soybean Aphid and Look-Alike Species.